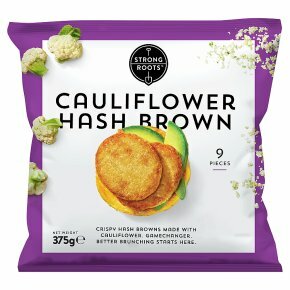 A crisp cauliflower hash brown perfect to share, for breakfast and as a side. Low sugar and saturated fat. GMO Free. Vegan. 1. Preheat the oven.2. Place the frozen product in a single layer on an oven tray.3. During cooking, turn once.200°C, Fan 180°C, Gas Mark 6 15-17 minutesAll appliances may vary. This is a guideline only.